This function will allow you to change a quote to an order. It will also let you set the Request/Promise Date to equal the Order Shipping Date? You can only change a quote to a “O” type order. Note: If you have an old order that you wish to copy to a quote, you can use the copy order function under COP Processing. Figure 5A.1 shows the setup screen for Change Quote To Order. The purpose of this function is to provide additional invoice printing features. 1. It allows you set up a default invoice form for a specific customer in the customer file. When you print invoice(s) for this specific customer, the system will use the invoice form defined in the customer file and not COP setup. 2. It will allow you to print an invoice immediately after billing an order. 3. It will allow you to print invoice(s) to disk. 4. It will eliminate the print alignment message before invoice printing. 5. 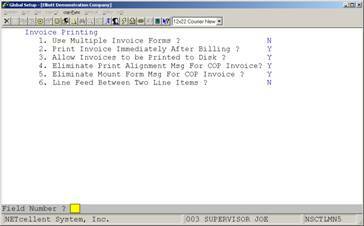 It will eliminate the mount form message before invoice printing. 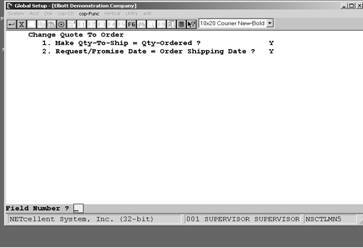 Figure 5B.1 shows the setup screen for Invoice Printing. Elliott COP is a feature rich module with many features and functions that are controlled in the Order Header, Order Line Item, and Order Billing Screens. Rather than enabling these features and functions that may not apply to all users, we give the user the option to select only those that apply to them or that they can use to better meet their needs and functionality. The COP managers or owners should review the options available with management and COP users, and then incorporate the options selected into their Procedures and Policies Manual. 1. Initialize Freight Amount on Order Billing? The purpose of this function is to pull-in the freight amount from a Manifest System (Starship). Flags 2, 2-8 are related to the Deposit Handling Enhancement. Flag these functions as “Y” and do their set up using the Deposit Handling documentation that follows. 9. Default Extra Charges For Terms Code? This is only a default field. The Terms Code function allows you to add an extra charge to an order by a set dollar amount or percent. Select “A” for dollar amount, “P” for Percent, or “N for none.